Regular readers will probably recognise this title as the sequel to one which we didn’t have the kindest words about in a previous review. We liked the concept, but it felt poorly developed. The theme of Avalon II’s predecessor felt like a bit of an afterthought. It seems that Micrograming must have felt similar as they thought it necessary to produce another instalment. Fans of Arthurian legend will be pleased to learn that this time around, there’s greater use of typical imagery from the theme and even Lady Guinevere makes an appearance. The soaring, sorrowful music of the original title returns, along with a host of new features. Fantastic look and feel. 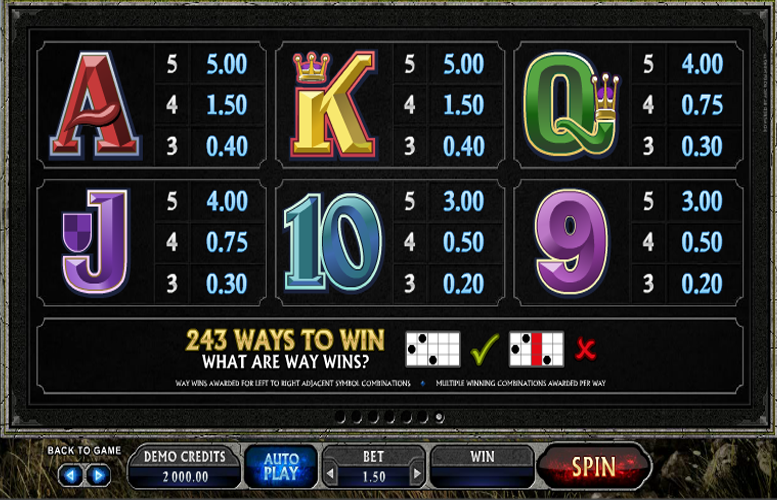 It’s like Microgaming pre-empted our comments about the original and stepped up their game. There’s even a load of animation thrown in too. Huge selection of side games and bonus features. The replay factor is strong with this one. Weirdly low upper betting limit. Low main game prizes. The plethora of side games and bonuses should offset this nicely though. 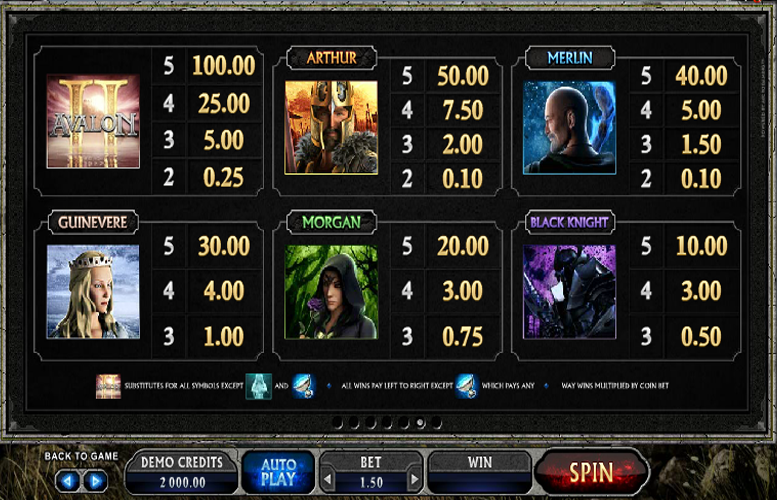 The top jackpot available is 120,000 coins and is earned via the bonus features (8 in total) offered in game. 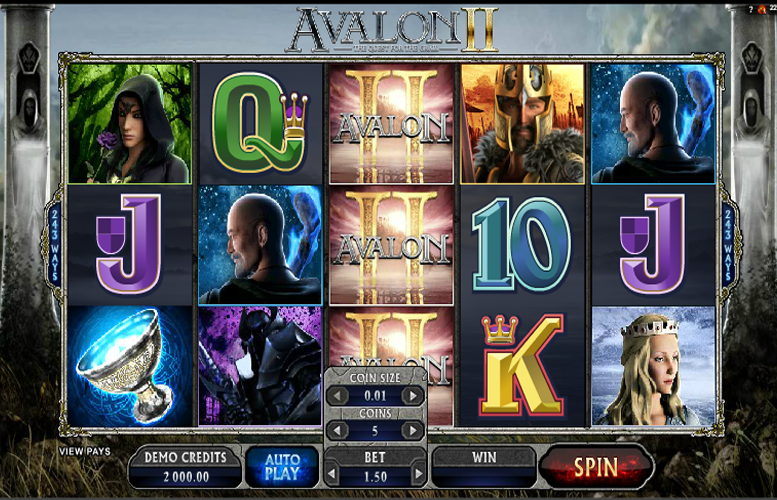 The regular jackpots in Avalon II are awarded for hitting five-of-a-kind of the higher value symbols. For Avalon’s sequel, there’s greater emphasis on characters from the legend of King Arthur. Curiously, Microgaming have listed the exact payments in an interactive pay table rather than give the factor by which a line bet is multiplied. We’ve therefore given each of the prizes for five matching symbols below in accordance with the maximum bet of £7.50. Landing three, four, or five holy grail “scatter” symbols on consecutive reels will trigger the Grail Bonus. From there, there are several side games, or quests which players can embark upon. They’re taken to a map between where different games will be triggered depending on their success to that point. On the Lake Legend quest, players must re-forge the sword Excalibur by rolling dice to assemble the fragments. Each roll will award a corresponding multiplier represented by different sections of the legendary sword. If players can re-forge Excalibur in just 10 rolls of the dice, they’ll be awarded an additional 15x the total bet. When it’s been fully restored, a reward of 6x the total bet will be granted for each remaining dice roll made. In the Misty Vale Free Spin Mode, players must nominate a character as an extra “wild”. The chosen symbol will then become a 2x multiplier too. If the selected icon forms part of a win line, players will be awarded twice the standard pay-out. In the Whispering Woods, the mystical white knight will present players with five shields from which to choose. They may keep the presented shield, or choose another. They’ll be given two chances to change their mind and are then forced to accept the prize. 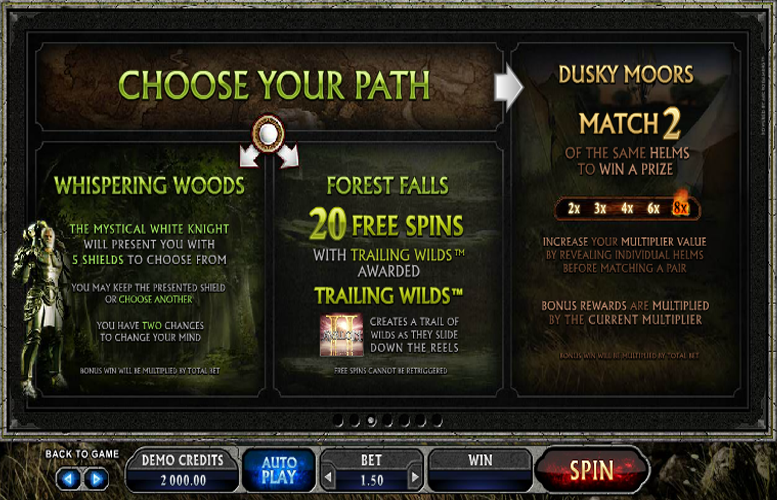 The Forest Falls side game is 20 Free Spins with “Trailing Wilds” awarded. Landing the game logo “wild” symbol creates a trail of additional “wilds” as they slide down the reels. 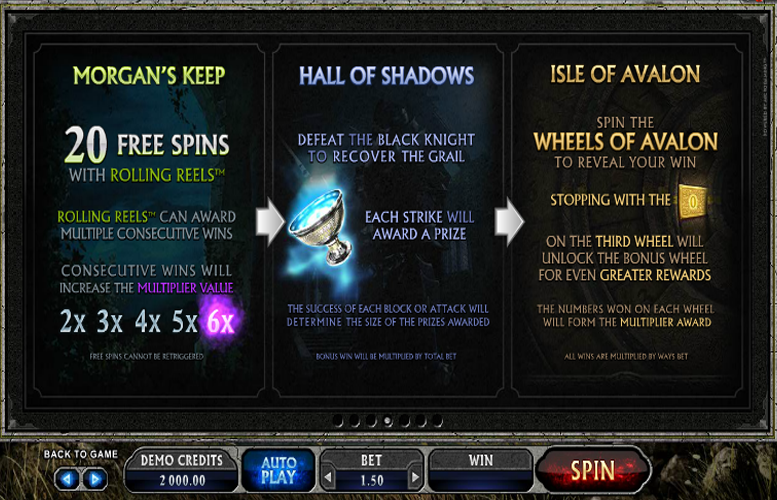 Unfortunately, these free spins cannot be retriggered. In Dusky Moors, players must match two of the same helms to win a prize. They can increase their multiplier value by revealing individual helms before matching a pair. Bonus rewards are multiplied by the current multiplier. The Morgan’s Keep bonus is 20 Free Spins with “Rolling Reels”. These “Rolling Reels” can award multiple consecutive wins. They’ll increase the multiplier value between 2x and a mighty 6x. In the Hall of Shadows, players must face off against the infamous black knight. Each successful strike and block will award a prize. The more accurate they are, the higher the prize will be. Players are presented with the “Wheels of Avalon”. They must spin them to reveal a win. Stopping the third wheel with the Golden symbol showing will unlock the bonus wheel for even larger rewards. The number won on each wheel will combine to form the total multiplier awarded. The great wizard Merlin can appear randomly during play. He awards a random cash prize or multiplier to players. The glowing Lady of the Lake symbol is an expanding wheel. If she lands anywhere on reel three, she can expand and award additional wins. As well as the game’s high value, character symbols, there are also those that don’t pay quite as well. As is tradition with online slot machines these days, these have been taken from the upper end of a standard deck of playing cards (A, K, Q, J, 10, 9). Each has been stylised to look like the kind of symbol you’d see on a knight’s shield. Again, we’ve had to list the prizes for hitting five-of-a-kind as though we’re placing a £7.50 total bet. Players are rather limited in how they can spread their bets out on Avalon II. Being as it’s a “ways to pay” machine, there isn’t the option to adjust the number of win lines. All that players can alter is the “total bet” and there aren’t that many increments. They range from just £1.50 per spin to an underwhelming £7.50 per spin. This narrows the appeal of Avalon II and means that both those wanting to play for tiny and big money will feel alienated. The Avalon II slot machine is a brilliant piece of design from Microgaming. It features lush animation, a strong theme, exciting action, and an absolute raft of bonus features. If you were disappointed with the original Avalon game, we’re confident that this sequel will be much more up your street. This game has a rating of 5 / 5 with 842 total reviews by the users.